Add our Haloz DRLs (daytime running lights) to your bike, and the 24 white incandescent LEDs will provide clear visibility for an evening or nighttime ride. 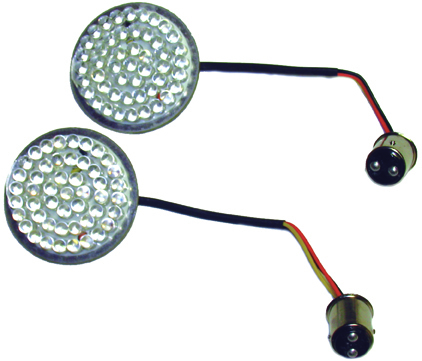 Activate your bike's turn signal, and these 24 white LEDs will blink and shift to amber. If you are replacing stock bulbs on an older bike (pre-2014), a load equalizer may be necessary in order to maintain stock flashing speed and avoid an error code on your dash (red key symbol). Click the "Extended Information" tab for more information on load equalizers. This product was designed and manufactured by Radiantz LED Lighting, Inc. and has been available to the public since 2010. The turn signal yellow / white combination is perfect I forgot to order clear lenses and had to buy them there wasn’t a problem have friends that want to do the same thing pretty sure they’ll be ordering from you thank you very much from Hawaii!! Love the lights. Put them on yesterday. Great price. These are great! extra lighting to the front - with eye-catching turn signal configuration! !